I'll continue with the lens reviews for now, yolo. 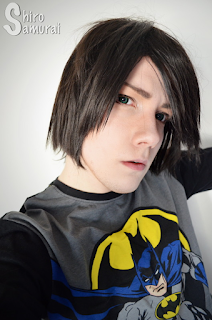 x) Today it's the Pop C Dark Green lenses by TheDollyEye that I'll show you all! TheDollyEye is often spelled as just DollyEye but yeah, it's the same brand I'm reviewing. Even though I'm pretty sure they're just a rebranding label but oh well, I don't dare guess what brand might be the actual maker of these lenses as that's a jungle in itself to figure out sometimes, lmao. In the vials the lenses look pretty colorful but in truth I think black is actually the primary color here. I mean sure they still look green and all but you think "ooh so dark" before "wow that's green", if that makes sense. xD The green that there is I can say is vivid and has a beautiful shade! The design is pretty straightforward – a super thick black rim with a kind of 'burst' effect towards the center; it's really pretty and not overdone. I like how it frames my eyes and makes the gaze look intense and mystical, it's a pretty cool effect! You can see that I have light blue-gray eyes and these do blend nicely, despite the intense color. It's a nice surprise as green lenses of this shade tend to look unnatural at the pupil hole, aka where my real eye color meets the lens. There is also a moderate enlargement effect, nothing that will make you gawk but it's definitely noticeable and the blackness adds the illusion of bigger eyes as well. I think the color coverage is good. I can't really complain about it as there's no question that these makes my eyes look green. A dark green with a massive amount of black but yeah, even that is far from my natural eye color lol. All photos taken by me during a May morning with a clear sky. Close-up photos are all free from color filters etc and that's so that the colors would be as true to real life as possible. Comfort was a bit of a ride for me. They felt a bit thick and scratchy on insertion but after a few tries it felt okay. Might just have been dirt but whatever the case I must say that I still almost constantly felt like I was wearing lenses and that's not a feeling I really like, especially when it's super noticeable when I move my gaze. It's not painful or anything but just... bothersome, ya know? Then again, I have immensely sensitive and dry eyes and am quick to react to even small discomforts so yeah, someone else might find these perfectly fine – everyone's eyes are different. Overall I'd still say that if you like this kind of design then these are worth trying. Comfort is always highly individual and so take my grade with a grain of salt. 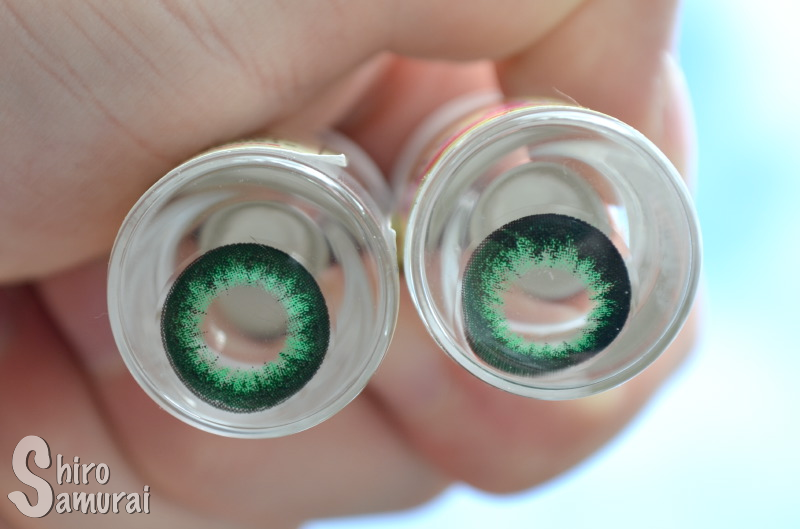 ^^" I think this is more a fashion lens than a costume lens and that's because these just simply look black when viewed from a bigger distance – it's mainly up close that the green really stands out. Want to see these lenses in other colors? Shows as green and it's a pretty shade but yeah, the black is what you notice first. 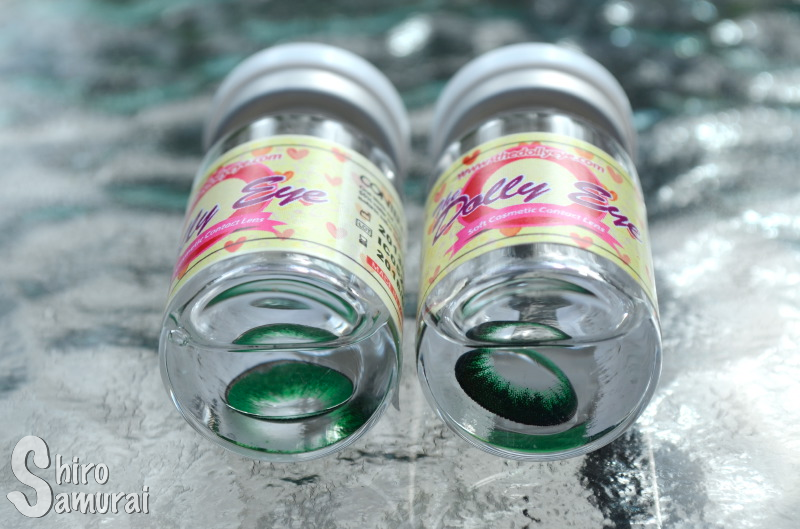 Features a 'burst' effect with an extra thick limbal ring. Pretty and intense. Good coverage, I don't really see my real eye color much at all. Enlargement is moderate. The blackness adds an illusion of bigger eyes. I keep feeling them in my eyes and they feel occasionally stingy/scratchy. Not all that comfortable but wearable for 1-2 hours on my mega dry eyes. Ain't natural with that massive black rim but yeah, not from Mars either.